Polarized Sunglasses are here. 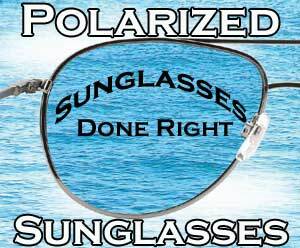 The one stop shop for polarized sunglasses. Are polarized sun glasses are known around the world because of unique styles and designer designs. Polarized Sunglasses styles like KD's, Rebel, Choppers, Freedoms, Navigators, Pilots, Rakes, Vagabond, Strikes, Tradewind, Fairings and Topsiders. And we also have kids polarized sunglasses and women's polarized sunglasses as well. Plus cheap prices and sunglasses made to last. Making us you #1 source for polarized sunglasses. - making it easy to see find your lure, to see a fish, stomps / logs, rocks or weeds. Polarized Sun Glasses are the best way to stop glare. - light reflecting off the water, boats, snow, cars or anything can be blinding and dangerous. These polarized sunglasses are made to stay on your head. - making it that your sun glasses don't fall off when your are bent over or in rough activity. Our Padded Polarized Sunglasses Float! - the padded polarized sunglasses are made to float, for when your picking up a fish or doing water sports. Our sun glasses are Cheap Polarized Sunglasses. - not only are these polarized sun glasses cheap, but they are still great quality. These polarized sunglasses are make in different styles and colors. - different strokes for different folks.
" Click any of these Polarized Shades to large "
These polarized sunglasses are the best in quality because they are provided by Pacific Coast Sunglasses. Best known for Motorcycle Sunglasses, Fishing Sunglasses, Motorcycle Goggles and Fishing Goggles. Polarized Fishing Sunglasses © Copyright. All Rights Reserved.